Magnetic stir bars are coated magnets used to stir liquids in a sealed container. They can stir fluids without requiring an opening in the container. They are a popular way of stirring liquids in modestly sized containers. Magnetic stirrers are used in chemistry and biology research, especially in medicine. Home brewers often use them to help make a yeast starter. Read more to learn about the neodymium stir bars offered by K&J Magnetics, and how to use them. What is a magnetic stir bar? A magnetic stir bar is a magnet that is encased in material that won’t react with the fluid it is immersed in. The K&J stir bar magnets included a molded layer of PTFE (a.k.a. 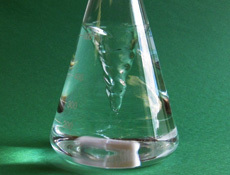 Teflon), which is not reactive for many liquids. The magnet is placed within a container and made to spin with an external magnetic field. Typically, this is produced by a stir-plate, which has another magnet rotating underneath the container. The chief advantage of this setup is that you can stir the liquid without having something stick into the container. The container can be completely sealed. Without a spinning shaft sticking into the container, there are no worries about leaks or lubricants contaminating the fluid. Why use a neodymium magnetic stir bar? Many stir bars are made with ceramic or Alnico magnets. Ceramic magnets are inexpensive and common, but not nearly as strong as a neodymium magnet. They have only about 8-10% of the pull force. Alnico magnets are made from aluminum, nickel and cobalt. They are stronger than ceramic magnets, about 25% of the strength of a neodymium magnet of the same size. They have been commonly used for stir bars, especially for high temperature use. The downside is that Alnico magnets have very low coercivity, meaning they are easiest to demagnetize. If exposed to a strong magnetic field, they can become weaker. They are often sold in pairs to avoid this, though they can lose strength through mishandling. Neodymium magnets are stronger than ceramic and Alnico magnets, and have the highest coercivity of all permanent magnet types. If you keep the temperatures of these N42H grade Stir Bar Magnets below 248°F (120°C), they should retain their magnetization practically indefinitely. A stir bar magnet is placed inside a container, immersed in the fluid. A separate magnet (or magnets) is placed underneath the container, so that it attracts to the stir bar magnet. The lower magnet is usually attached to a motor that spins it. If the magnets are close enough, the stir bar magnet spins inside the container. You can purchase a stir-plate mechanism that has a motor and the magnet underneath from laboratory equipment suppliers. In the video below, we make our own version using an inexpensive fan from a computer and a few magnets. 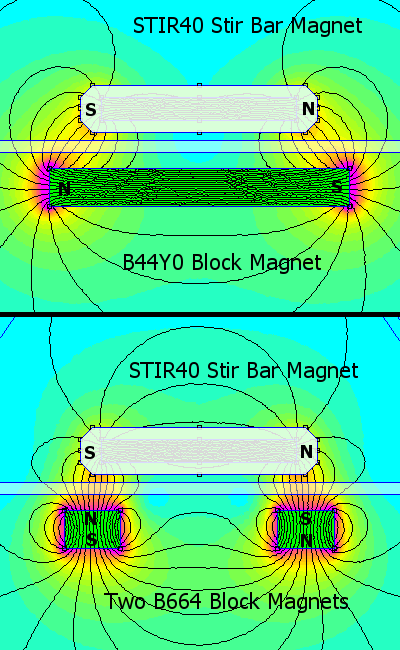 The top image shows a STIR40 Stir Bar Magnet with a B44Y0 magnet underneath. The lower image shows the same Stir Bar Magnet with a pair of B664 magnets underneath. We found more strength using configurations like the lower image. Should you make your own stir-plate or purchase one? That depends both on your budget and how you will use it. Lab quality stir-plates come with built in speed controls that usually work quite well. Lab stir-plates often incorporate a heating element, handy if you need to keep your solution warm. A homemade stir-plate made with recovered materials (like a fan from a PC) can be quite inexpensive. This project is popular among home brewers who prepare their own yeast for beer. If you use a lab-quality stir-plate, be sure to check what type of magnet is used inside. A neodymium magnet is the strongest type of permanent magnet, and typically works best with these strong Stir Bars. A ceramic or Alnico magnet inside the stir-plate is much weaker than a neodymium magnet. While it will still work with the neodymium stir bars shown here, it is possible to demagnetize the ceramic or Alnico magnet inside the stir-plate. The most relevant measure of a stir bar’s strength is the maximum torque you can feel when twisting it. Stronger torque translates to greater stirring ability before the magnet-to-magnet pair "slips." Below is a quick demonstration of how to use a stir bar magnet. The stir-plate mechanism uses a fan from a computer and an old PC power supply as a 12V source. You might use a simple DC power plug for input power rather than a big power supply. Also consider using a potentiometer to adjust the speed. How about a bigger volume of water? What can a little stir bar magnet do inside a 5-gallon bucket? A lot! In our videos, we used a strong D6C cylinder magnet to retrieve the stir bar from the fluid. Our TIN1 sample package of magnets has a useful collection of magnet sizes and shapes, which we used for the stir plate mechanism. The B662 block magnets we taped to the fan came from the TIN1 sample pack. For help identifying the poles of magnets, see: Which Pole is North? A magnet with a marked north pole like the D4X0-ND or an electronic EPID can be very helpful.